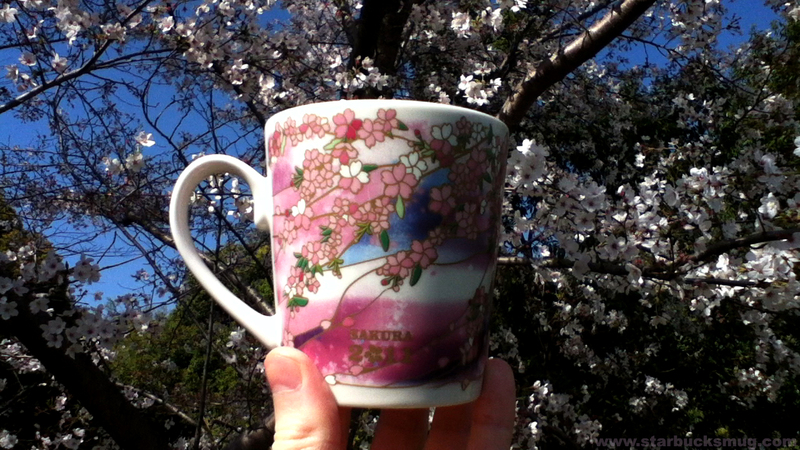 This year’s Sakura mug definitely has to be my favourite so far. Thankfully Starbucks abandoned the style they unsuccessfully used for the Sakura 2010 Starbucks Mug and have gone back to the Sakura 2007 shape. I love the use of the blue and green. These two colours really do reflect a true life Sakura experience with the blue sky and green leaves starting to appear on the branches. Check out my video of the 2011 Sakura Mug against a sakura tree in Tokyo Japan to see how impressive the design really is when compared to a real cherry blossom tree. Something else I love is the addition of the metalic gold paint used for the branches and also the words “SAKURA 2011”. It’s a classy subtle design idea and it works really well. I also love how the design fades towards the top and bottom of the mug so it doesn’t get a cheap looking white bar that a lot of the older Starbucks mugs end up with. Really nice design. Can’t wait to see what Sakura designs Starbucks has in store for Sakura 2012! Where can I get myself one of these Sakura Starbucks mugs without going to Japan? Honestly the Sakura mugs sell out so quickly and they’re all gone now. Definitely a seasonal thing from March onwards until they sell out. Have heard they also sell them in Singapore as well. :\ You should be able to find some on eBay though. I JUST found my love for this collection and this post, TODAY! I have been to Japan on a deployment and was there Jan-Jun 2007. I’m kicking myself in the shins right now for not having purchased (or the knowledge that Starbucks even had this line) while I was there. eBay will just have to be my outlet for the time being… 🙁 The 2011 line was absolutely stunning. I’ll have to keep an eye peeled for the 2012 line. Looking forward to 2012’s Sakura mugs! When do the new Sakura mugs come out? With my recent purchases of Nagano and Tokyo, it looks like I might be joining the mug collecting club soon. Am I crazy for that? lol. I’ve def been on the look out for them! The 2012 Starbucks Sakura mugs should come out in a month or so I think. Can’t wait as I love their Sakura merch!